An eShelf is broadly defined as an environment in which a brand has the opportunity to list its products, specifically with the direct aim to sell. In recent years, the Search Engine has been treated less as a source for information and more as a competitive marketplace, with retailers identifying Search Engine Results pages as one of the first points of contact with consumers. 60% of consumers cite an online channel as their first point of contact with a product, while 49% of these are making their initial product searches on Amazon, compared to 36% on Google & other search engines. 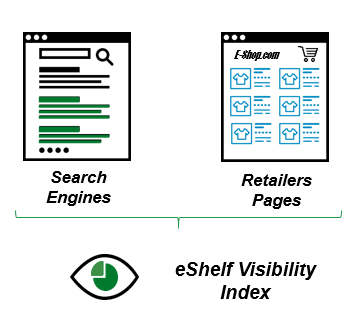 An eShelf visibility score is calculated as the number of brand listings on an eShelf, divided by the total number of listings available. The first stage in estimating brand visibility on search engines is to collate all ads served against search terms; a brand’s share of voice is then calculated within these ads. To do this, an Ad (which is served by a domain) that mentions a brand, is attributed to that particular brand. That is to say, an Argos Ad which mentions Samsung is attributed to Samsung. Any non-branded Ad served by a domain is also attributed as such. This is a core metric in the understanding of overall brand visibility as it helps brands to understand not only how often their own Ads are showing, but also how often they are referenced in Retailer shopping Ads. Brand visibility across all 3 search types (PPC, SEO, Shopping) is recorded and can be aggregated for an overall share of search engine metric. In the case of the TV search space in the UK, 45% of listings are non-branded as they are being served by Retailers. 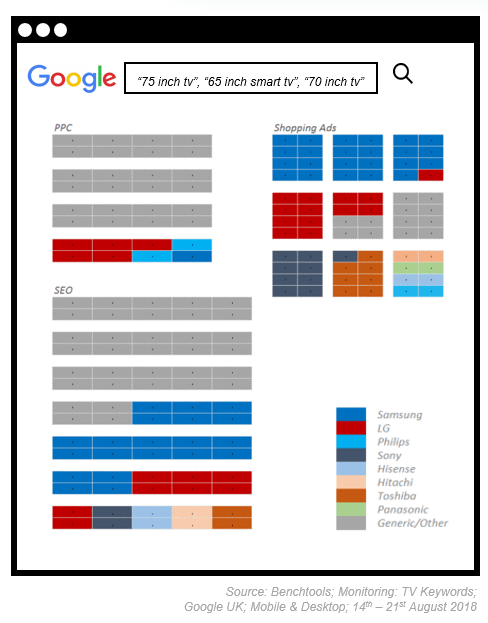 Samsung records a strong presence on organic listings and is also very well represented on Shopping listings. This is due in part to the fact that it runs its own Shopping campaigns, which immediately give it an advantage over direct competitors who only appear in retailer listings. Despite not running its own listings, LG does have strong retailer support as seen by its high share of voice on Shopping listings. As retailers are appearing with higher frequency across Google search results, it becomes increasingly vital to understand what happens within their pages. Not only are retailers commanding more of the SERP, but they are also becoming the first point of contact for online purchasers. Brand visibility is then estimated per retailer. (number of times a brand is listed on a page / total number of listings). This visibility is then indexed based on various factors including relative traffic to retailer as well as a brand’s average position on retailer. 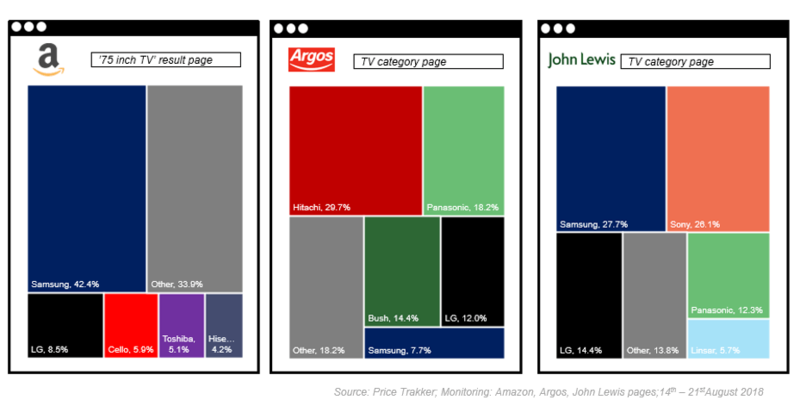 In the UK, Samsung has the strongest presence across both Amazon and John Lewis. Its presence on Amazon means that overall it commands the highest share of retailers’ pages for the TV category, due to the vast amounts of traffic that Amazon generates. The large ‘Other’ block on the Amazon page reflects the high quantity of smaller brands being advertised on its pages – even including items like TV brackets and wall mounts, which Amazon displays on TV results pages. Other metrics can be taken from the products displayed on the retailer pages. These metrics include product price, discount, star rating, number of reviews, whether the product listing its sponsored or organic, position on the page. We are also able to dive deeper on a product level and explore other areas such as delivery information and stock levels. Collecting these metrics means that we can start to paint a picture brand-by-brand, and begin to quantify and assess success per retailer. Estimate your brand presence on retailer’s pages. Highlight presence of your competitors. Assess how online retailers are supporting your brand and products. Monitor your product prices across various retailers. Ensure they use your latest marketing claims and/or your competitors do not use misleading claims. Adjust your paid listing strategy and investment in order to increase your visibility. Leverage eShelf insights to activate campaigns across Search and on E-Commerce platforms.